Magnificent historical project managed by the Faculty of Arts and Architecture at the University of Brighton featuring extensive visual material from their expanding Design History Research Centre (DHRC) Archives and associated collections. Be sure to check out the superb 'Oral Testimony and the Interpretation of the Crafts' section by Matthew Partington (Research Fellow, Applied Arts UWE/V&A, Director NEVAC). Taking up the rallying call of Classic Cafes, this wonderfully designed Scottish site has a wealth of material: "All the photos here are of old things. Old cafes, old bakeries, old offices, old grocers, old art. Mostly from the 1950s and 1960s. A lot have been taken in Glasgow, the rest all over Scotland. I just like the old lettering, and old shapes and old terminology." The nation needs dozens more sites like this and it needs them now! Paul Talling's superb pot-pourri of architectural abjection: "Derelict London is an unusual photographic portrait (over 550 pics) of the nations capital... an often un-picturesque view of everyday life in London. All pictures were taken by myself (mainly within the last year) during many miles of walkabouts... After years of travelling via car or public transport I realised just how little I had seen of London." Ruin-nation: Who took the motor outta Motor City? An important organization for all lovers of caffs and associated enclaves. Worth joining if only for the regular newsletters and info on walks and tours - not to mention the excellent range of in-house publications like the stunning Festival of Britain book. "In November 1979 a group of architects founded The Thirties Society, concerned that buildings of the era between the two World Wars were not generally appreciated, and were often threatened. The Society's prime objectives are education... conservation... (and) extending our knowledge about those buildings or artifacts, whether important or humble, rare or commonplace... that characterise the Twentieth Century in Britain." Vital stuff. "Last century, many architects believed that advances in technology could be harnessed to produce a better quality of life for all. For better or worse, these Modernists have changed the British landscape forever. This is how they did it... "
Flâneur is a magazine dedicated to the celebration of urban life, the sanctification of the stroll... In the tradition of literary flâneurs-Walt Whitman, Fran Lebowitz, Alfred Kazin, Joseph Mitchell, Flâneur seeks to scrutinize the city, to evoke the essence of the street. And to encourage flaneurial behavior, whether detached observation or decadent gadding about. From Le Flâneur newspaper (Paris May 3 1848): "To go out strolling, these days, while puffing one's tobacco, while dreaming of evening pleasures, seems a century behind the times. We are not the sort to refuse all knowledge of the customs of another age; but, in our strolling, let us not forget our rights and our obligations as citizens. The times are necessitous; they demand all our attention, all day long." "The Los Angeles Conservancy is dedicated to the recognition, preservation, and revitalization of the architectural and cultural heritage of greater Los Angeles. With a two-fold mission of advocacy and education, the Conservancy works to preserve existing architectural resources by developing preservation strategies and by raising public awareness of the value of those resources through tours, lectures, publications and major programs... " As fine an alt.architecture website as you could wish for. "Los Angeles restaurants and bars from the 30s, 40s, 50s and 60s (movie palaces, motel signs, and associated remnants... Musso and Frank's, the Formosa Cafe, Miceli's and Canter's...) This website concentrates on those bastions of a bygone era. These are the places I call 'time machines' ... a restaurant, hotel, bar or other building interior where you can sit and feel like you've returned to the past. Sitting in these places, one has the illusion of a time gone by when life had a slower pace, people cared about quality and integrity, and life's pleasures were more simple and innocent... Surprisingly, however, there are still a wealth of places left (and many I have yet to discover). The more interest we can collectively generate in these places (and patronize), the more likely the rate of destruction will at least slow..."
'...I drove from Eastern Pennsylvania to Minneapolis and back, stopping in small towns and poking around in empty clubs, funeral homes, any kind of public space and making photographs, the one final subject of which is interiors used for some public or common purpose... I am searching for ways to use the light, color and form to crystalize their beauty, poignancy, irony, wealth and humanity.' This micro-site is part of the magnificent docu-arts web resource Journale project in New York - quite simply one of the greatest things to be found on the Net. 'I have been shooting in this documentary style for years, including a long-term project documenting life in San Francisco (and New York). I started the site in december of 1995 and every week I shot somewhere in San Francisco and then posted selected images. I focused on places that I love. I work almost exclusively in black and white. Bringing this project to the Web was an attempt to share with others, on a greater scale, the city I see and love.' A really welcome photo-project that covers a lot of ground in fine style. Pissed up on booze and looking for 'local' action... Not a 'good-pub' guide, not a 'good beer' guide, just... a Pub Guide! 'Every pub we know in London, located, rated and illustrated.' Don't be tempted to take the weight off your trainers and retire to a nearby All Bar One - plough through fancyapint first and do the right thing! For instance: "For down-to-earth watering holes, The Lord Clyde (Borough) and the Red Lion (in Crown Passage): The Clyde is an astonishingly overlooked pub (Perhaps the pub guides want to keep it to themselves?) Spotless, beautiful place - more due to love and care from the family who run it, than from a cleansing brewery makeover. The Red Lion is wall-to-wall with suits most nights but when the cigar smoke clears you're left with a friendly old place. Civil bar staff and a fascinating clientele. The doorman for the block of flats Una Stubbs lives in drinks here most nights, and the Queen's Mother chef is known to sup here... Parental Warning: we always recommend The Phene Arms in Chelsea but mock-rocker Keithly Richardington and soccer-sot Georgio Bestio are bound to be collapsed in their customary corners. Web presence of the fantastic Troubadour (265 Old Brompton Road, London SW5 9JA): 'The Troubadour was founded by Michael and Sheila van Bloemen in 1954 in Earl's Court, the wild western frontier of bohemian Chelsea. Through the 50s and 60s it was a key centre of London intellectual and artistic life. It's where Private Eye was first produced and distributed; where the early Ban the Bomb meetings were held; where Bob Dylan first performed in London. Paul Simon, Charlie Watts, Sammy Davis jnr and Jimi Hendrix all played here. Richard Harris fell in love with his wife Elizabeth here (she was doing the washing up). Ken Russell recruited staff for his first shorts here and became friends with Oliver Reed. Led Zeppelin used to come and jam here after their Earl's Court gigs." Bring own beard, sandals and bongos! Excellent personal portfolio site that includes a collection of odd signs, packaging and printed instructions found with various products. Emerald - the editor - has a particular obsession with milk logos. Don't miss the toilet-paper and tampon instruction leaflets: "At college I got a bit obsessed about launderettes ...the signage, the old advertising, the mechanics of the machines ...even the smell and warmth of the places ... why the milk thing? I'm not sure - it kind of crept up on me. I just love the imagery, the packaging, the whole idea that milk is this cool, fresh, 'every thing you could possibly want' from a drink thing. And then, pow, I ended up with this collection of stuff that just keeps growing!" Another UK site covering useful period links. Award winning site upholding the proper London pub experience. "In many ways London's suburbs are where some of the most interesting socio-architectural experiments have taken place - drool at descriptions of leafy-green Georgian Barnsbury and lap up idyllic pictures of Betjeman's Metroland." Campaign site of the famous bikers cafe in North London - they've now rebuilt and re-opened the original space. Useful starting point for exploring the: 'De Quincey of contemporary English letters' Mr Psychogeography himself. He's: 'the demented Magus of the sentence' you know! A great site detailing many lost Polynesian bars of America. The original Tiki fanzine of living populuxe legend Otto Von Stroheim. Unparalleled. Part of the online Encyclopedia Britannica website. It's an excellent resource for the British music and fashions of the Sixties. It includes a study guide just for students, and a quicktime video of a 1966 Carnaby Street fashion show. Fab! If Classic Cafes has brought out the Hornby in you, this soccer site may well add to the malaise: 'Launched by the makers of When Saturday Comes OTF has become a magnet for all those souls interested in the sort of intelligent, amusing, informative, emotional, facile, educated, hilarious, trivial and surreal football and non-football chat that simply doesnt exist anywhere else on the net.' True. UK roadside nosheries for truck drivin' guys with fries on their minds. The impact of design and technology on Wellington New Zealand café culture, from the 1930s milk bar to the 1960s coffee bar. 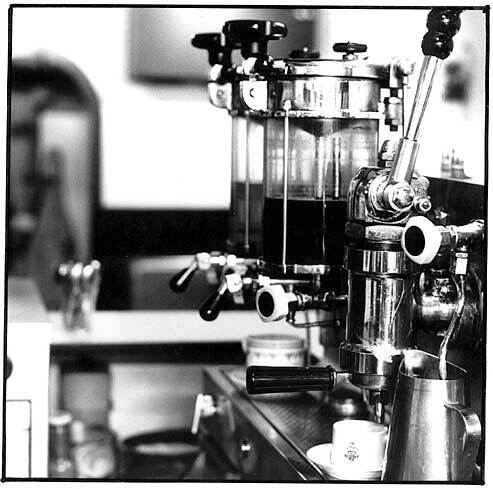 'A continental touch': international and national influences on the development of coffee houses in Wellington New Zealand from the 1940s to the present day. Tea shops dominated the daytime, supplied mainly by two large companies, the Aerated Bread Co and J Lyon's & Co, which opened the first tea shop in 1894 in Piccadilly. By 1995 around 20 per cent of all drinks bought in Britain were soft drinks. According to John Burnett, this trend represents a 'cold drinks revolution', a transformation in our Liquid Pleasures comparable in scale to the 'hot beverages revolution' of the late-seventeenth century. The postwar migrants left the poverty and strife of the Old World to make new lives, and in the process revitalized Australia... and the UK. Rosie's Diner - a deluxe, streamlined diner built by the Paramount company in 1946 - was owned and operated by the Corrado family (Tex, Ralph and Arnie) in Little Ferry, NJ until 1990 when it was moved and restored to its original beauty. Vespa-reclamation centre in Waterloo with an espresso bar. There's a 1950's machine and some interesting original music posters from the 1930-40's on the walls. Superb historical resource packed with treasures: "J. Lyons & Co. became one of the largest catering and food manufacturing companies in the world. Lyons became a household name and the 'Joe Lyons' Corner Houses and teashops, with their 'Nippy' waitresses, caught the public imagination and passed into history. Always innovative and with an acute awareness of popular taste, Lyons brought a unique blend of showmanship, style and spectacle to its aim of combining high quality with value for money. The first Lyons teashop opened in 1894 at 213 Piccadilly. It was the forerunner of some 250 white and gold fronted teashops which occupied prominent positions in many of London's high streets and suburban towns and cities; corner sites with two entrances were preferred... The Lyons company survived for over 100-years. During this whole period it did not feel it wanted to change its name and from 1887 until 1998 it proudly traded as J. Lyons & Company." Paul Secular's lateral London listing site with a focus on happenings/places with a Mod slant: "Modernism, my friends, is more than a religion - it's tied in to the very fabric of human existence - it represents man reaching for existence in the ONLY way really - it represents total FREEDOM... Being a modernist is about wanting to experience the best life has to offer, and not being bound in by artificial boundaries, shackles, confines. Modernists are artists - their lives the 'canvas'..."